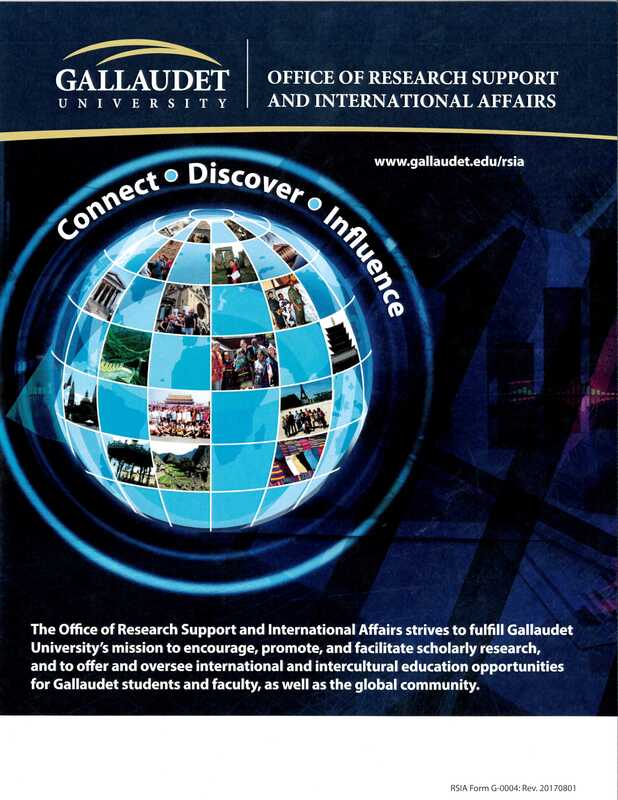 The Office of Research Support and International Affairs (RSIA) strives to fulfill Gallaudet University's mission to encourage, promote, and facilitate research, and to offer and oversee international and intercultural education opportunities for Gallaudet students and faculty, as well as the global community. A central online resource for faculty, staff, and administrators about international-related matters. To log in to the manual, click https://my.gallaudet.edu/international-affairs and select International Policy Manual from the left sidebar. Research at Gallaudet Newsletter - Read Gallaudet University's Spring 2017 publication on the latest research activities at Gallaudet. Global Connection Newsletter - This new publication provides information about Gallaudet's outreach efforts in serving the global community. Look up Gallaudet faculty and students' research and scholarly achievements in a wide range of fields.